I do not really understand what nationality is. If nationality represents a place of birth of an individual, so can I say that Vitaliy Klychko has Kazakh Nationality? He was born there and lived there for some period of time, but he does not have any connection with that country. Nationality is a complex issue. It is more to do with what you feel is your country than any strict definition. 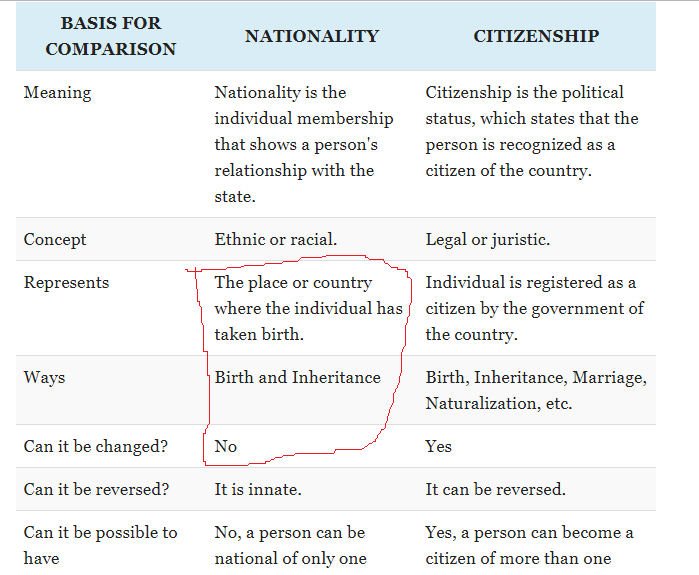 The table is wrong to assert nationality represents "place of birth". You may not feel a connection to a country that you happened to be born in. For example a person born in Khazakstan to Ukrainian parents may feel a closer connection to Ukraine than Khazakstan. A person may be born in Russia, but identify as being Chechen, or Ukrainian, or Yakutsk, or from one of the many nationalities found in Russia. A person may be born in England, but identify as both English and Romani. Or have parents from with different nationalities and identify with both of their parent's nationalities. It is possible to have a complex of connections. Nationality is complex. The table greatly oversimplifies it. Not the answer you're looking for? Browse other questions tagged word-usage word-choice word-meaning or ask your own question. What's the difference between “citizenship” and “nationality”? 'Shot' or 'Filmed' to overcome its ambiguity?